WisCon was a very easy “intro con” for me because 1) I live in Chicago and Madison is very close by, 2) I could crash with my brother, and 3) everyone kept repeating over and over again what a kind, small*, welcoming con WisCon was. I’m happy to report, the experience was absolutely wonderful, and I would be more than happy to attend again, or perhaps branch out to other cons. *Note, did anyone actually say it was a small con? Because it totally wasn’t, at least by my definition, but that was certainly the impression I had been given! But kind and welcoming were accurate at least. To show how absolutely committed I was to attend this con, I rode the bus from Chicago. It was very crowded, but it wasn’t nearly so bad as it could have been. However, though I did get *some* writing done, it wasn’t as much as I had hoped. Turns out bouncing around in the dark, shoulder to shoulder with strangers, is not the conducive writing environment you might think it would be. I found myself wearing a lot of different hats at the con. Some panels I attended as a writer, some as a blogger, and some just as a fan (a Welcome to Night Vale panel? Say whaaaaat!?). When I didn’t find a panel that sounded interesting, I attended readings, wandered the dealers’ rooms (print of a tiny dragon snuggling with a kitten for Evie’s birthday? Check! ), or grabbed a coffee in the con suite. Oh con suite, you were exactly as advertised: stuffed full of free pop and coffee, frozen pizzas, and those hot dogs on rollers. With dusseldorf mustard! DUSSELDORF MUSTARD! 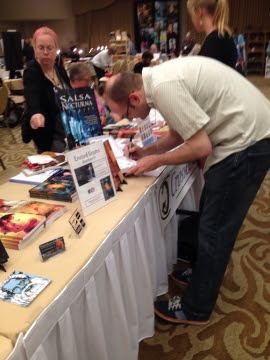 The biggest and best part of the con is that it made me feel like a writer. The first part of that was the reading I did as part of Clockwork Lasercorn on Sunday morning. Considering that I hadn’t actually met any of the others in real life until about 15 minutes before the reading, and considering that we were slotted at 10 a.m. on a Sunday morning opposite a lot of other great programming, it all could have gone horribly wrong. But it didn’t! At all! Our group totally meshed, everybody’s stories were awesome, and mine seemed to be well received. I got compliments afterwards. I don’t think anybody knew I had never done a reading before. Our reading was at a coffee shop, which I kind of liked, because anybody could just come in off the street and listen. It was pretty dead when we got there, but it actually filled up. I think we had about 18 or so, plus the 5 of us. And best of all? Ann “Ancillary Justice” Leckie came to my reading! Little did I know, she’s friends with my co-readers, and also super, super nice. This was the closest to my fanboy moment of the con. She just beat Neil Gaiman out of a Nebula for best novel, what, a week ago? And now she’s listening to my story? Awesome. But! But! That was not all, oh no, that was not all. I dropped by the Crossed Genres booth to pick up a copy of Long Hidden (which sold out after their excellent panel, so I’m glad I grabbed a copy early!) and to see if I could say hi to Bart and Kay who published me in OOMPH. Not only did I get a chance to chat with Bart for awhile, but he asked me sign all the copies of OOMPH they had on hand. I can’t tell you how much that made my con. I’ve never done any kind of book signing before, and it was pretty cool. They even put a little “author signed” tent on top of the books later. The only downside is that I kept bumping my head on the door after that, since I was walking around 10 feet tall. The thing is, Long Hidden is blowing UP right now (for good reason! I just started reading it and it’s already so good! ), and Bart had a lot going on this weekend. Yet I felt like he really was enthusiastic about meeting me and went out of his way to make me feel good whenever I bumped into him at the con. Now, since I was staying with my brother, I didn’t have the “true” con experience of hanging out in the bar, attending any of the con parties, or signing up for any of the tabletop gaming sessions (I missed a chance for both Last Night on Earth and Small World). The fact that there was a Jem party that I did not attend is outrageous. Truly, truly, truly outrageous. On the other hand, while I would no doubt have had a good time doing any of those things, I think I would enjoy them more if I had “con friends” whom I was anxious to see. Maybe in years to come. However, I did get a chance to experience some of the general Madison ambiance, such as drinking liters (that’s plural) of beer out of a boot to the tune of polka music, attending the world’s largest brat fest, and grabbing a to-go lunch from a place that offered to substitute your fruit cup with a “cheese cup” (yeah, that’s pretty much what it sounds like). 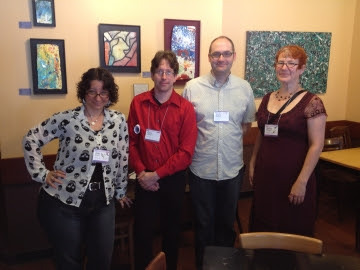 I did want to make one final note about WisCon. As you might have guessed from the logo at the top, WisCon is the “world’s leading feminist science fiction convention”, with a strong focus on embracing people traditionally left out of science fiction fandom: women, people of color, people with disabilities, gay people, transgendered people…you know, the vast majority of everybody in the world. Now, I must admit, as a white, cisgendered male, this made me a little nervous. Not because I feel uncomfortable around these groups of people (which is good because, you know, they’re the vast majority of everybody in the world), quite the contrary; I believe anybody who knows me would tell you I am fully prepared to rock a feminist science fiction convention. No, I was nervous because I was worried about intruding. However, I have to say, it wasn’t an issue at all. Not only was everyone wonderful and welcoming as only a crowd of people who know what it feels like to be unwelcome could be, but there really were people of ALL stripes present, including people like me. And honestly, when I looked around the con, it didn’t occur to me to see women, people of color, people with disabilities, gay people, or transgendered people. What I saw was just a lot of people. The best kind of people: science fiction and fantasy nerds. 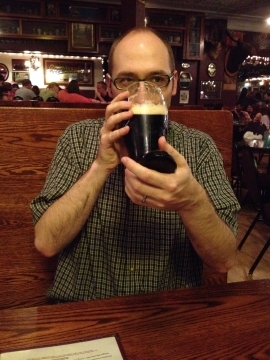 Shane lives in Chicago with his wife and two kids, where he writes software by day and avoids writing stories by night. His fiction has appeared on Escape Pod, Daily Science Fiction, OOMPH: A Little Super Goes a Long Way, and elsewhere. 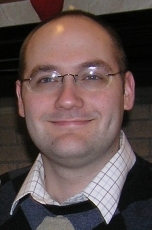 He blogs regularly at shanehalbach.com or can be found on Twitter @shanehalbach. Yay! Glad you had a good time. And definitely sign up for panels next time you go. WisCon is great for getting panel experience, since it lets everyone sign up (not just Big Names), and you can choose what panels you’re actually interested in being on. It also tends to have panelists who are good at taking turns, and a great audience. Staying at the hotel is great if you can swing it. Maybe just do one night? Though I honestly couldn’t suggest which night would be best!